Elizabeth makes pastries outside her home in Nicaragua. On a good day, Elizabeth earns $3.78 selling pastries she makes in the home she shares with 12 other family members. That’s a good day. Sometimes, she makes less. Elizabeth and her family live in Nicaragua. Her daughter Yalieska, the future doctor, is sponsored by Paul and Ruby from Kansas. Through their sponsorship, Yalieska has access to nutrition, health care, clothing and school supplies, which Elizabeth says helps the family a lot. Elizabeth’s husband is a construction worker, which is seasonal employment. He earns $75-$90 a month. With his income and the little Elizabeth earns, after they pay rent there is little left to cover their basic needs. Elizabeth hopes to get a better-paying job in the future. She wants to build a house so her family can have more space and live in a safer neighborhood. Elizabeth is the secretary of her mothers group. She takes attendance and makes the agenda for the group’s meetings. 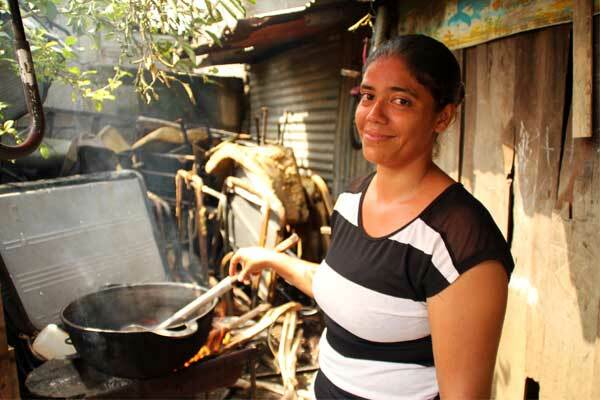 Although Elizabeth and her family live in poverty, they are not defeated by it. They fight it. Elizabeth fights every day as she sells pastries. She also washes clothes to earn money. Yalieska fights by going to school and not giving up on her dreams of becoming a doctor. And Yalieska’s sponsors, Paul and Ruby, fight poverty, too, by making a commitment to Yalieska and her family. Elizabeth knows the challenges she faces may be difficult, but she also knows love will help them through it. “I would like to provide my children with a good education, give them love,” Elizabeth said. “That is what children expect from you, love. That we push forward with them; help them in their studies. To give her what she wishes for. Help a family fight poverty. Sponsor a child today.